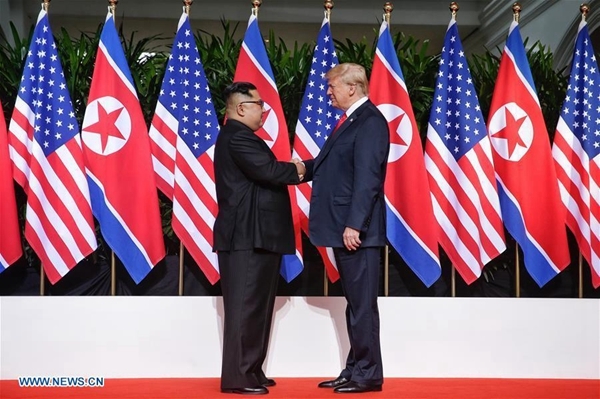 U.S. President Donald Trump on Thursday revealed a letter from the top leader of the Democratic People's Republic of Korea (DPRK), in which Kim Jong Un expressed optimism for future DPRK-U.S. ties. In the letter posted by Trump on Twitter, Kim called his historic Singapore meeting with Trump in mid-June "the start of a meaningful journey." The DPRK top leader voiced his belief that "the strong will, sincere efforts and unique approach of myself and Your Excellency Mr. President aimed at opening up a new future between the DPRK and the U.S. will surely come to fruition." "I extend my conviction that the epochal progress in promoting the DPRK-U.S. relations will bring our next meeting forward," Kim wrote in the letter. Trump in the tweet called the letter, which was dated July 6 and provided in Korean along with an English translation, a "nice note" from Kim. "Great progress being made!" Trump claimed. The date of the letter was around the time when U.S. Secretary of State Mike Pompeo was on a three-day visit to Pyongyang, a trip ending up with Pompeo lauding "progress" while Pyongyang calling the talks "regrettable." U.S. State Department spokesperson Heather Nauert told reporters on Saturday that Pompeo, though not meeting Kim during his stay, did leave a letter from Trump to Kim in Pyongyang. U.S. President Donald Trump revealed a letter from the top leader of the DPRK, in which Kim Jong Un expressed optimism for future DPRK-U.S. ties.